Souleymane Doukara’s 90th minute penalty sealed a battling 2-0 victory for Leeds United over third-placed Reading. The win was based on some heroic defending and impressive organisation to deal with a passing team and it lifted the Whites back up to fifth in the EFL Championship. 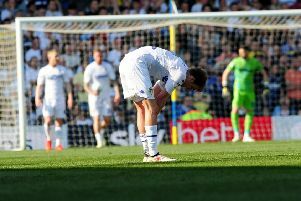 It came at a cost, however, as Leeds lost top scorer Chris Wood to a tight hamstring injury in the first half after he had opened the scoring with his 14th goal of the season. United set up with a different 4-1-4-1 formation with a lack of defensive midfielders to choose from and Kalvin Phillips suspended following his red card against Brighton. Stuart Dallas came in for him with Doukara and Kemar Roofe both playing deeper roles initially. They started in lively fashion, pressing their opponents high up the pitch, and created several good positions early on without the final pass or cross quite dropping well. Roofe sent a shot over on 10 minutes following a clever run into the box by dangerous winger Hadi Sacko. At the other end, Joey Van Den Berg’s cross took a wicked deflection and was parried away by home keeper Rob Green. Dominic Samuel then got round Pontus Jansson in the area, but his low cross could not find the unmarked Garath McCleary after it was superbly cut out by Kyle Bartley. Within a minute Leeds opened the scoring as Sacko attacked the visitors and saw his mis-hit cross fall invitingly for Wood to hammer the ball home. Wood hit a 20-yard shot over soon after, but his game ended early when he was taken off in the 33rd minute with a hamstring injury. Substitute for him was Liam Bridcutt, back after a long absence through injury, with the formation changing to a 4-2-3-1 and the versatile Doukara going up front. Dallas threatened to add to the lead with a surging run into space down the left, but his shot from the edge of the box went over. Charlie Taylor tried his luck with a free-kick from 25 yards out only to fail to get enough power into his shot to make the save easy for Ali Al Habsi. Reading enjoyed lots of possession with the home crowd joining in with sarcastic “ole’s” at one point, but rarely threatened as the opening half ended 1-0. A lively start to the second half saw Liam Kelly shoot narrowly wide for Reading while Roofe fired well wide after hitting a shot on the turn following a smart pass by Dallas. Paul McShane headed over for the visitors after a corner was not cleared before Leeds centre-back Pontus Jansson went up for a Charlie Taylor free-kick and got a header in, but Al Habsi was left with an easy save. Reading got on top for a spell as their passing started to be made in the home half, although it was from a wayward Taylor pass that they had their best chance with Roy Beerens getting space to shoot and Green having to make a fine save to tip the ball over. Green had to make another save to keep out Yann Kermorgant’s header, but Leeds held on in a rearguard effort. They finally created something in attack when Ronaldo Vieira’s surging run set up sub Matt Grimes on the edge of the box and his shot was saved low down. They sealed victory in the 90th minute when Taylor’s run into the box was halted by Chris Gunter’s clumsy push and Doukara put away the resulting penalty. Leeds head coach Garry Monk thought his side were worthy winners and praised the spirit shown by the players. He said: “It’s not easy for us because we’re down in a few areas, but we thoroughly deserved the points. “We were the most dangerous team on the pitch and we limited them to having possession in areas where they couldn’t hurt us. We limited them to almost nothing in terms of chances. “Yes, we need to challenge ourselves to be a bit better with the ball, but we’re at the stage of the season where it’s important to grind certain results out, stick in and show character. This team has that in abundance. Monk hopes the injury to Wood is not too serious. He added: “It’s a hamstring tightness. “We won’t know for 24 hours but we’re hoping it’s nothing serious. “It didn’t look like a bad one from where I was standing but we’ll have to wait until he gets assessed. Leeds: Green, Ayling, Bartley, Jansson, Taylor, Vieira, Sacko, Doukara, Roofe (Mowatt 70), Dallas (Grimes 82), Wood (Bridcutt 33). Reading: Al Habsi, Gunter, McShane, Moore, Blackett, Evans (Meite 78), Kelly (Cooper 87), Van Den Berg, McCleary, Beerens, Samuel (Kermorgant 61).